Add a special element to a photo canvas by creating your own personalised canvases with text. Design a photo gift with a personal touch which will be cherished for years to come, or customise photography to adorn your home with. Choose from a range of fonts, colours and frame sizes to make your personalised photo canvas with text truly unique to you. Using a superior printing method and handmade frames, we create beautiful reproductions of your designs. Our sublimation printing process produces a professional quality print with sharp details, giving your photo canvas with text a contemporary feel. A stylish matt finish completes the print, which is complemented by the natural grain of the woven canvas. Scratch resistant and durable, we’re so confident in the quality of our canvas prints with text that we offer a lifetime guarantee with every order. Create your own canvas with words and customise your photos in our online design studio, to create your personalised canvases with text. Our online tool is easy to use, allowing for full control over your design and the final print. With a photo canvas with text in flexible sizing options, you can choose the size that will best suit your photo canvas with text. For a more personal gift you can select a smaller option from 30 cm x 30 cm, or for a wall canvas, you can go up to 150 cm x 200 cm for a large-scale photo print. Choose from a 2.5 cm thick frame for a lightweight canvas option, or a 4.5 cm frame which can give your design more depth. This option is necessary for larger personalised canvases with text, as it gives the piece more stability. A heavy, woven canvas comprised of 100% poly is the perfect choice for presenting and preserving your beautiful designs. Unlike its cotton counterpart, poly will remain strong over time and keep your personalised canvases with texts looking beautifully vibrant. A gentle and even grain gives your prints a gallery quality feel. A strong and sturdy canvas will keep your print looking fresh and vibrant for years to come. Using FSC approved sustainably sourced pinewood, we handcraft our wooden canvas frames onsite in the UK. Our premium wood is warp-proof and won’t crack or split throughout the years, guaranteeing a long-lasting reproduction. We always opt for 8 stretcher wedges over the traditional 4, to get that perfectly tensioned canvas which can be adjusted over time should it need it. Sublimation dying creates a stunning and vibrant print by using a combination of heat and pressure to lock the ink directly into the canvas fibres, rather than simply laying them on top. This creates incredibly durable and richly coloured personalised canvases with text. The result is a sleek matte finish with vivid colours and an even tone, with no shiny coating on top. Because of the nature of our printing process, your print will be completely scratch resistant – you can even wipe it clean or wash it if you ever need to. To preserve the colours in your new photo canvas with text, keep it out of direct sunlight. Our materials and processes are eco-friendly wherever possible. We use environmentally friendly inks alongside our sustainably sourced wood, to give you peace of mind. We offer a range of wrap options for your photo canvas with text, such as a gallery wrap where the image continues over the canvas edges, a mirror wrap where the image is reflected on the edges, simple coloured edges, or no wrap. Easily select this option when you press “Start Design”. It’s important to choose the most suitable wrap for your image, so check our design tips below for further guidance on selecting the best option. To make hanging your canvas with words simple, we’ll include a free wall hanging kit with every print. Simply attach the picture hook to the back of your new canvas frame, then hang on any wall with ease. Screws and wall plugs are also included. When creating personalised canvases with text, it’s important if your text is very close to the canvas edge, try selecting a coloured wrap option as this won’t distort the text and will add a pop of vibrancy to your design. If the focal point of your image is centred in the canvas rather than near the edges, a gallery wrap can extend and wrap your image beautifully around the frame. Note that with designs where a large area of your canvas prints with text is left white, the stretcher bars can sometimes be visible through the canvas material. The bleed is the area around the edge of the print, where leeway is left for the printing process. This area may be cut off, so don’t include any of your text or important details within this area. However, it may still be visible on the final print, so it’s still important to fill the bleed with part of your design background. Personalised canvases with text are an exciting way to add a personal touch to a photo gift. A canvas with picture and words can create a wonderful memory, particularly for a family member or friend. Why not try creating a photo canvas with text for a friend’s birthday? 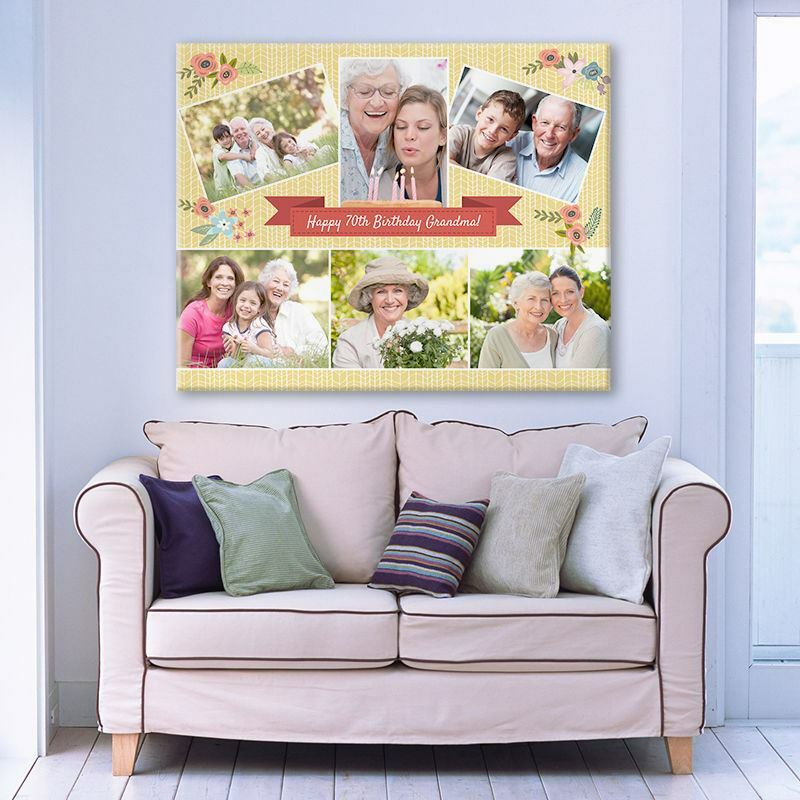 You could include multiple photos of the two of you, alongside a special birthday message adorned across the front of the canvas. A photo canvas with text can be a creative addition to your living room or kitchen, perhaps sharing a snapshot of a special family event with the date or location written underneath the photo. This idea similarly makes a beautiful wedding gift for a happy couple. Alternatively, try hanging a selection of smaller personalised word canvases along a hallway or stairway to add some colour into the home. 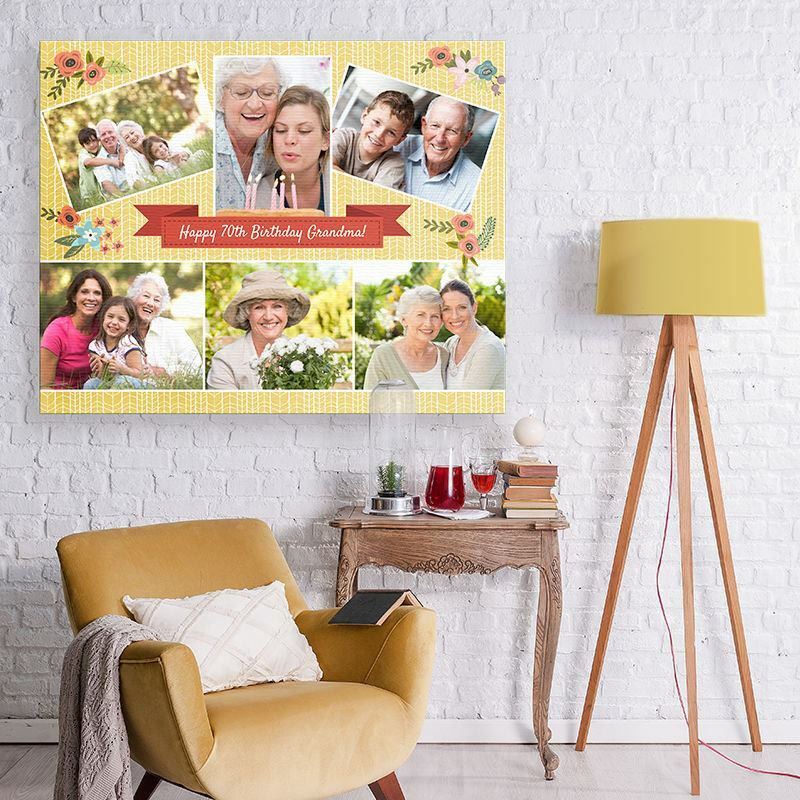 If you can’t decide on just one image for your personalised photo canvas with text, why not try designing a creative photo collage with our montage option? Select multiple photos and choose a layout or border, to display your photos in a fun and imaginative way before adding your text. Why not try the heart scatter shape, which arranges multiple photos in the shape of a heart? This canvas print with text makes a perfect gift for a loved one.